Accessing, browsing or otherwise using the site indicates your agreement to all the Terms and Conditions in this agreement, so please read this agreement carefully before proceeding. If you do not agree to any of these terms, then please do not access or use the Mofour Wakeboards website. Subject to the terms and conditions of this Agreement, we hereby grant you a limited, revocable, non-transferable and non-exclusive license to access and use the Site by displaying it on your internet browser only for the purpose of interacting with Mofour Wakeboards Site content and shopping for personal items sold on the Site and not for any commercial use or use on behalf of any third party, except as explicitly permitted by us in advance. Any breach of this Agreement shall result in the immediate revocation of the license granted in this paragraph without notice to you. You understand that when using the Mofour Wakeboards Website, you will be exposed to User Submissions from a variety of sources, and that Mofour Wakeboards is not responsible for the accuracy, usefulness, safety, or intellectual property rights of or relating to such User Submissions. You further understand and acknowledge that you may be exposed to User Submissions that are inaccurate, offensive, indecent, or objectionable, and you agree to waive, and hereby do waive, any legal or equitable rights or remedies you have or may have against Mofour Wakeboards with respect thereto, and agree to indemnify and hold Mofour Wakeboards, its Owners/Operators, affiliates, and/or licensors, harmless to the fullest extent allowed by law regarding all matters related to your use of the site. All text, graphics, button icons, images, audio clips, and software (collectively, “Content”), belongs exclusively to Mofour Wakeboards or its affiliates. The collection, arrangement, and assembly of all Content on this Site (the “Compilation”) belongs exclusively to Mofour Wakeboards or its affiliates. All software used on this Site (the “Software”) is the property of Mofour Wakeboards, its affiliates or its Software suppliers. Mofour Wakeboards logos, slogans, trade names or words are registered trademarks, trademarks or service marks of Mofour Wakeboards, its affiliates, suppliers, or third parties. The use of any of our trademarks or service marks without our express written consent is strictly prohibited. You may not use our trademarks or service marks in connection with any product or service in any way that is likely to cause confusion. You may not use our trademarks or service marks in any manner that disparages or discredits us. You may not use any of our trademarks or service marks in meta tags without prior explicit consent. This Site may be accessed from countries other than the EU contries. This Site may contain products or references to products that are not available outside of the EU contries. Any such references do not imply that such products will be made available outside the EU contries. If you access and use this Site outside the EU contries you are responsible for complying with your local laws and regulations. This site is created and controlled by Moplan d.o.o. in the Slovenia. As such, Slovenian laws will govern these disclaimers, terms, and conditions, without giving effect to any principles of conflicts of laws. The object of this agreement is to define the terms of sale of products sold on the website www.mofourwakeboards.com (referred to hereinafter as “the Website”) between Moplan d.o.o., the Seller, and any person aged over 18 and/or having the capacity to enter into a contract (referred to hereafter as “the Customer”) and wishing to make a purchase for his/her strictly personal reasons, excluding any professional or commercial purpose (referred to hereinafter as “the Parties”). It is expressly agreed between the Parties that the Terms and Conditions of Sale in effect on the date of purchase and accepted by the Customer govern their dealings exclusively. If a particular matter is not provided for in these Terms and Conditions of Sale, current practices in the sector of distance selling involving companies with their head office in Slovenia will be applied. This agreement is available in English. Prices are indicated in Euros (€) including taxes. Prices include Value Added Tax (VAT) applicable as of the date of the order in the country where the Seller is based. The Seller is free to change the sale price of its products at any time. However, the prices indicated at the time of purchase are the prices applicable to this purchase and cannot be modified once the Customer’s order has been confirmed. The price of products does not include delivery costs of the order which remain payable by the Customer, the amount of which will be indicated when checking the ‘cart’ as well as on the order before it is confirmed. By confirming an order, the Customer agrees to pay the full price previously indicated. In the case of an obvious error in the price of a product, the Seller reserves the right to cancel the purchase of this product, at no charge for the Customer. The Customer can make changes to his/her cart prior to final confirmation. 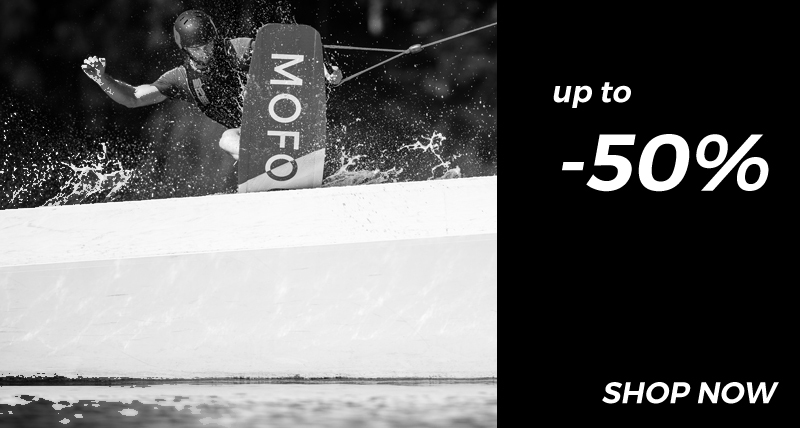 Once the Customer checks the required box and clicks on “Place Order” or “Continue to Payment” at the end of the ordering process, he/she is bound by the order and accepts the Mofour Wakeboards terms and conditions of sale. Once the order is recorded, a confirmation message will be automatically displayed on the Website, indicating the order number and details of the products purchased. After receiving the order, the Seller will e-mail the Customer a detailed acknowledgement of receipt for his/her order indicating the products ordered and the amount billed (including taxes and shipping costs). By issuing this receipt, the Seller accepts the order placed by the Customer. By placing an order, the Customer accepts the prices and descriptions of products purchased as well as the Terms and Conditions of Sale in effect on the date of the order. For any exceptional orders (due to quantities ordered or delivery address in particular), the Customer must contact the Customer Service. For the countries of the European Union to which the Seller agrees to deliver the products, orders are payable in Euros (€). If the local currency of the Customer differs from the currency in which the prices appear on the Website, the Customer’s bank will apply the exchange rate in effect on the date of the order (unless a different rate is applied on a discretionary basis by the Customer’s bank). Consequently, changing the country of delivery can change the price of the products given the change in currency. The customer can pay for his/her orders on the secure payment server (PayPal) by Visa card, Mastercard or American Express card indicating his/her card number, expiry date and the last three figures on the back of the card. The customer’s account is debited as soon as he/she places the order. The customer can also pay for his/her orders with PayPal account. The Seller has set up a process for the protection of transactions with a view to ensuring the security, integrity and confidentiality of payments made on its Website. Credit card numbers are not stored in the Seller’s systems. None of the Customer’s bank information goes through the Website or is recorded on a public server or on the Seller’s servers. However, the Seller cannot be held liable for damages resulting from events outside its control related to the use of electronic means of communication (failure or delay in the transmission of electronic communications/data, interception or manipulation of electronic communications by third parties and/or computer viruses). Next to each country is an estimated delivery time in days. From Monday to Friday, orders confirmed before 4 p.m. (CET) are handled during that day. If you have confirmed your order after the deadlines indicated above, it will be handled on the first working day after the date of the order. If your order is confirmed on Saturdays, Sundays or public holidays in Slovenia, it is going to be handled on the Monday or first working day after. Please note that the delivery times are expressed in working days and vary according to the destination (working days are days actually worked in the company, which excludes Saturdays, Sundays and public holidays). Delivery delays are estimated once parcels have been dispatched from our warehouse. If the delivery time indicated by the Seller when placing the order is not respected, the Customer can cancel his/her order. When the order is cancelled, the Seller reimburses the Customer immediately and, in any case, no later than within 7 days after the termination of the contract, for any sums paid in accordance with the contract. The standard shipping method applies for all free deliveries unless indicated otherwise on Mofourwakeboards.com. The Seller has appointed different carriers to transport products ordered. The Customer must sign the delivery note issued to him/her by the carrier on delivery. If it is not possible to deliver the order to the Customer (Customer not in, address wrong or cannot be found, Customer has not provided necessary entry codes, inability to access delivery address, etc.) the carrier leaves to the Customer a note stating that he attempted to deliver the parcel and indicating the procedure to retrieve the parcel. More often, carriers attempt to deliver the parcel 2 or 3 more times at the delivery address and/or indicate the closest depot to the delivery address from which the parcel may be picked up. If the delivery is still impossible, the parcel is returned to the Seller and kept by him for 30 calendar days at the Customer’s disposal. Partial deliveries can be made if, for example (but not only in this case), certain products are unavailable. In this case, the Seller will inform the Customer by e-mail to the address provided to it when ordering. The Seller will propose a new delivery time for the products that are unavailable and the Customer will be free to accept this or not. The Seller will not bear the additional shipping costs which will be billed to the Customer. If the Customer refuses the new delivery date, the Seller will consider the delivery as successful. On delivery, the Customer shall inspect the products and packaging to check whether the products are damaged or not. If the products are damaged, the Customer shall refuse the delivery to courier and shall fill out the delivery claim form and will also notify Mofour Wakeboards about the incident. The Seller will reimburse him/her for the full price of the damaged products as well as the delivery costs within 7 days after the Seller has received the damaged products and recorded their return. The Customer has a period of 30 days from the date on which he/she takes physical possession of the product(s) ordered on Mofourwakeboards.com to return the product(s). The returns are not free of charge. The returned product(s) have to be sent at the latest on the 30th day after which he/she took physical possession of the product(s) ordered on Mofourwakeboards.com. If the last day of this period falls on a public holiday, a Saturday or a Sunday, the period shall end on the first working day thereafter. All product(s) have to be securely enclosed in a package as Mofour Wakeboards cannot accept damaged product(s). The returned product(s) have to be intact and complete, not stained or dirty and must not have been washed or worn, and in the original undamaged packaging. Rejected returns will be sent back to the customer. In the case of partial deliveries (several products ordered at the same time by the Customer and delivered separately), the withdrawal period starts from the delivery of the last product ordered. When the product consists of batches or several items, the withdrawal period starts from the delivery of the last batch or last item. The Customer informs the Seller of his/her decision to return the products before the end of the withdrawal period by sending the products back to the Seller along with the withdrawal form attached to the delivery note. The sending of either the withdrawal form or the products before the expiry of the withdrawal period must be provable (for example in the form of a postal receipt). Concerning items on sale or on free promotion, the Customer has a period of 14 days to return the products after the day on which he informed the Seller. The Seller will reimburse the Customer for the full price of the products returned, using the payment method utilized to place the order as soon as possible and at the latest within 14 days after the date on which the Seller received the Customer’s withdrawal notice and the product(s). The period begins when the Seller receives the notice of withdrawal or the products. In general, for the computation of time, the day of receipt of the notice of withdrawal or the products shall not be counted as part of the period. If the last day of this period falls on a public holiday, a Saturday or a Sunday, the period shall end on the first working day thereafter. However, reimbursement will only be made when the products returned have been received by the Seller. The products are covered by a conformity guarantee and a guarantee for hidden defects, enabling the Customer to return defective products or products that are not as ordered. The Customer has a period of 2 years from the effective delivery of the product to make a claim under the conformity guarantee. To this end, the Customer informs the Seller that the product is not as ordered within a period of 2 months from the date this is noted. Unless proved otherwise, any problem that appears within 6 months after delivery to the Customer is presumed to exist at the time of delivery; after this time, the Customer must provide proof that the problem existed on the date of delivery of the product concerned. In such circumstances, the Customer can claim the repair or replacement of the product, or, if this proves impossible or disproportionate for the Seller (for example, if the costs are excessive compared to a reduction of price or cancellation of the contract), the Customer can obtain an appropriate reduction of the price and keep the product concerned, or get a full refund with the return of the product concerned to the Seller (cancelling the order is not possible in the case of a minor problem). The Customer also has a means of redress for hidden defects allowing him/her to either return the defective product and get a refund, or keep it and be reimbursed for part of the price. This action must be brought by the Customer within a period of 2 years from the discovery of the defect. The Customer can make claims by contacting the Customer Service and/or by sending the products back to the Seller along with the form attached to the delivery note. In all cases, if the Customer’s claim is justified and achievable, the Seller will, if applicable, repair or replace the product concerned for free, offer an appropriate reduction of the price or reimburse the Customer for the full purchase price of the product concerned as well as the delivery and return costs. Reimbursements are paid using the payment method utilised to place the order as soon as possible and no later than within 14 days after the date on which the seller received the claim from the Customer and the product. However, reimbursement will only be made when the product returned has been received by the Seller. If the Customer’s claim is not justified, the Seller will inform the Customer of the reasons for its refusal and, as chosen by the Customer, the product will be made available in the Seller’s warehouse or shipped to the address indicated by the Customer, at the Customer’s cost, within 30 calendar days after receipt by the Seller of the product returned by the Customer. The Customer and the Seller agree that any digital element exchanged between them (data, information, files, dates and times of logging onto website, etc) constitute admissible, valid, useable and probative proof. The Seller stores electronic documents relating to orders for a period of 10 years from the order being placed. Archives are kept on a reliable and durable medium in accordance with the current law. The Seller accepts its liability for damages caused to the Customer following the violation by the Seller of its legal or contractual obligations. On the other hand, the Seller’s liability cannot be incurred in the case of non-fulfilment of its legal or contractual obligations attributable either to an unforeseeable and insurmountable act on the part of a third party to the contract, or to a case of force majeure as defined by Slovenian case law, or due to the act or fault of the Customer. Similarly, the Seller’s liability cannot be incurred for any inconvenience or damage related to the use of the Internet, in particular an interruption in the availability of the Website, a break in service, an outside intrusion or the presence of computer viruses, damages or alterations of data or files or for any indirect damage, whatever the causes and consequences. The Website may contain links to third party websites not published or controlled by the Seller which therefore declines all liability as to their content and as to the relations the Customer might enter into with these third party websites. Subject to more favourable public policy provisions of the law of the country in which the Customer has his/her usual residence, these Terms and Conditions of Sale as well as relations and/or disputes resulting from sales on the Website are governed by Slovenian law. In the case of a dispute that cannot be resolved amicably, the Customer can choose to bring an action before the courts of the country where the Seller is based or before the courts of the country where he/she is resident. 1. Rider should wakeboard in control and should not use speeds that exceed the skills of the rider. Too slow is better than too fast. All riders should be towed at the boat speeds that allow reasonable control and stability. 2. Use correct size of board and binding. Wet binding and feet with water before use. Check and tight binding screws before each use. 3. Even if properly fitted, the binding may or may not release in the fall, which could result injury. 4. Attempting land or dock starts can increase the injury or death. USE ONLY ON WATER. 5. Do not use in shallow water or near shore, docks, pilings, swimmers or either watercraft. 6. Always wear a U.S. Coast Guard approved Type III (PFD) vest. This sweepstakes is void where prohibited by applicable law. The sweepstakes is open and offered only to anyone age 13 or older. Winners may be required to sign an affidavit of eligibility as a condition to the delivery of the applicable prize. Employees and their immediate families/household members of MOFOUR Wakeboards and their respective parent companies, affiliates, and subsidiaries are not eligible to enter the sweepstakes. We reserve the right to disqualify any entries that we believe in good faith has been generated by a so-called spam or automated e-mail program or via scripts and automated submission. By participating, all entrants agree to abide by these rules. Prizes are specified in the description of promotion game. Entries and prizes are nontransferable. No substitutions are permitted, except that sponsor reserves the right to substitute a prize of equal or greater monetary value for the grand prize. Winners shall be responsible and liable for any federal, state, and local taxes on the value of their prize, shipping costs and customs fees. A random drawing take place on date specified in description of promotion game. The number of eligible entrants will determine odds of winning. In the event of a dispute regarding the identity of the person submitting the entry, the entry will be deemed to be submitted by the person in whose name the facebook account is registered. The decisions of MOFOUR Wakeboards are final and binding in all matters relating to this sweepstakes. Winner will be notified by email and/or Facebook post, as determined by MOFOUR Wakeboards. If a winner is found to be ineligible, an alternate winner may be also be selected from the pool of eligible entries. An entrant or winner may be disqualified from the sweepstakes if he or she fails to comply with each provision of these official rules, as determined at the discretion of MOFOUR Wakeboards. 4. Unless prohibited by applicable law, entry constitutes permission to use an entrant’s name, address (city, state, country) and testimonials in all media, in perpetuity, in any manner MOFOUR WAKEBOARS deems appropriate for publicity purposes without any further compensation to such entrant. By entering or accepting a prize in the sweepstakes, winners agree to be bound by these official sweepstakes rules and to conform to all federal, state, and local laws and regulations. When applicable, the winner will be required to execute and return to MOFOUR Wakeboards within five business days an affidavit of eligibility and a liability and publicity release to be eligible for the prize or an alternate winner will be selected. Winner may be required to furnish proof of identity, address, and birth date in order to receive prize. By entering, an entrant agrees to release and hold MOFOUR Wakeboards, subsidiary, and affiliated entities, directors, officers, employees, attorneys, agents, and representatives harmless from any damage, injury, death, loss, claim, action, demand, or other liability (collectively claims) that may arise from their acceptance, possession and/or use of any prize in their participation in this promotion, or from any misuse or malfunction of any prize awarded, regardless of whether such claims, or knowledge of the facts constituting such claims, exist at the time of entry or arise at any time thereafter. Any person attempting to defraud or in any way tamper with this sweepstakes will be ineligible for prizes and may be prosecuted to the full extent of the law. MOFOUR Wakeboards reserves the right to modify the rules of the sweepstakes in any way or at any time. MOFOUR Wakeboards reserves the right, in their sole discretion, to cancel or suspend this sweepstakes should viruses, bugs, or other causes beyond their control corrupt the administration, security, or proper play of the sweepstakes.